I had arrived at the 40th ARRS (Air Rescue and Recovery Squadron) in February of 1970. 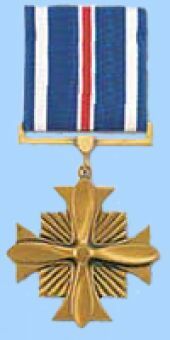 The squadron at that time was based on Udorn Royal Thai Air Base (RTAFB) on the northern border of Thailand and Laos. 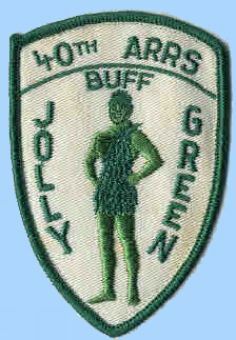 The squadron was one of two “Jolly Green Giant” rescue squadrons in Southeast Asia, the other squadron being the 37th ARRS at Da Nang, RVN. 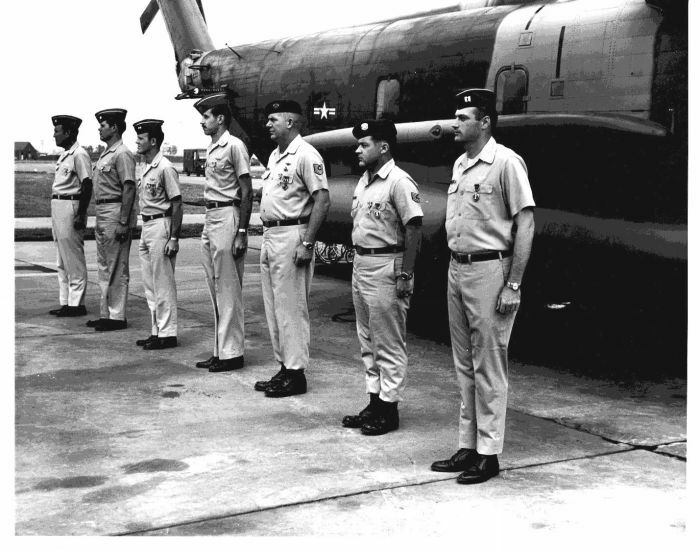 The mission of the squadrons was to rescue any airmen shot down or forced to bail out of an aircraft anywhere in Southeast Asia, which included South Vietnam, Cambodia, Laos, and North Vietnam. These squadrons were supported by a HC-130 squadron that provided overhead communications and coordination with attack aircraft and forward air controllers (FAC’s). The HC-130’s also provided in-flight refueling support for our helicopters. Our close air support came from a dedicated detachment of A-1 aircraft from the Special Operations Wing located at Nakom Phanom RTAFB. These A-1’s used the call sign “Sandy” or “Spad” when supporting a rescue mission. I flew the HH-53C aircraft which had replaced the original HH-3E Jolly Green. The HH-53 was twice the size of the HH-3 and had considerably more power and firepower, being armed with 3 General Electric 7.62mm mini-guns. It was referred to as “Super Jolly”. The rescue mission that I was wounded on was for a F-4 Phantom crew from the 8th Fighter Wing at Ubon RTAFB, call sign “Wolf 06”. The F-4 had been on what they called a “Fast FAC” mission near the base of the Mu Gia Pass between North Vietnam and Laos, one of the major passes that supplied the Ho Chi Minh Trail complex. It was considered a very dangerous and heavily defended area and the F-4 Forward Air Controllers were used here instead of the slower O-2 and OV-10 FAC's. A major road of the Ho Chi Minh Trail came through the pass into a river valley surrounded by very steep cliffs, known as Karst formations. The Karst was full of caves and the North Vietnamese had installed anti-aircraft guns in many of the caves. The guns were 12.7mm, 23mm, 37mm and 57mm. In 1970, the HH-53’s had no night capability whatsoever and all rescue attempts were limited to daylight. The standard operating procedure for the Jolly Green squadrons at the time was to have two aircraft on what was termed Alpha Alert from sunrise to sunset. These aircraft could be airborne within 10 minutes of receiving a notice to launch. The primary pickup aircraft was called the “Low Bird” and the wingman was known as the “High Bird”. Typically, there was also a Bravo Alert with two more aircraft and crews that could launch within 45 minutes of receiving a launch order. On the 20th of March 1970, I was the copilot of the Bravo Low crew. When the “Mayday” call from Wolf 06 was heard during the night by our HC-130 (they maintained a 24 hour a day orbit) our Alpha Alert crew launched at daylight from Udorn, about a two hour flight for them to the site of the survivors at 150kts. In the meantime, the Sandy alert crews launched from Nakhom Phanom, RTAFB, about 70 miles from the survivors, they would get there a hour prior to the Jolly Greens. The HC-130 got a forward air controller (FAC) assigned to the mission and was requesting fighter support for MIG protection and to attack the gun emplacements. When the Sandy aircraft arrived at the scene and determined that this would be a difficult rescue, they took over as on-scene commander and requested additional Sandy aircraft. For several hours, numerous airstrikes were put in to suppress the ground fire and smoke was used to mask the survivors (known as Wolf 06 Alpha and Wolf 06 Bravo). At around 3 PM, the Alpha Low Jolly Green made an attempt to rescue the survivor (who was the back seater in the downed F-4, Wolf 06 Bravo) but took intense ground fire and had the rescue hoist shot off his aircraft. He limped back to Nakhom Phanom, accompanied by his High Bird. Bravo was in a much more dangerous position than Alpha, who was located about a mile south of Bravo, halfway down a steep hillside. More airstrikes were put in and the area around the survivors was gassed with a non-lethal disabling munition, code named “Apeman”. As sunset was approaching, the on scene commander made the decision to try one more rescue attempt before darkness set in. These were frequently called “Last Light Efforts”. It was now our turn in the barrel as the Bravo Low aircraft. The Sandy lead aircraft had found a narrow canyon that led down into the main valley where the survivor (Bravo) was located on a sand bar at a bend of the river. There was heavy foliage on both sides of the river. We entered the narrow canyon at our maximum airspeed of 170kts about 10 feet above the trees, jinking left and right every few seconds. We had a Sandy with us on our right side about 20 yards away. The A-1 used his 20mm cannons and fired anti-personnel rockets known as LAU-59’s to suppress ground fire. We received several small arms hits during this run-in, the most serious was a hole in the fuel line that ran from the refueling probe to the fuel tank. This caused a small amount of consternation from our Flight Mechanic and Pararescue specialist who were standing near the fuel line. When we entered the main river valley from our narrow canyon all Hell broke loose. We were now flying in the trees, so to speak, dodging the tree tops and I could feel the branches hitting the bottom of our aircraft. From the caves above us, every gun opened up and I could see the tracers from the 23mm, single, dual and quad mounted, as well as the 37mm rounds flying by in groups of 5. We tried to stay near the base of the cliffs and the guns could not depress down far enough to hit us. The Sandy's had now formed a “daisy chain” on our right side and one of them would roll in behind us, strafe and fire rockets, pull up as another was rolling in behind us. These guys had to pull up and dive down through the wall of fire coming from the caves above us. Our run down the river valley to the survivor was just over a mile and we told the survivor on the radio to pop his orange smoke flare. We spotted him standing in tall grass and pulled the nose of the helicopter up and used maximum power to come to a stop over his head. We had flown into a trap! Just as we had come to a stop, with the nose still up about 15 degrees and the hoist cable started down, we got hit with withering small arms fire, 7.62mm and 12.7mm. Pieces of “stuff” were flying around the cockpit, holes appeared the windshield, the standby compass disappeared from the glare shield and I could feel the rounds hitting the armored cockpit floor. Right then, the fire warning light on the left engine came on and the engine instruments started to unwind. Sandy lead called on the radio “Jolly your left engine exploded and you are on fire. Get Out, Get Out, Get Out”. The HH-53 cannot hover on one engine and we had to get flying speed immediately. We rolled the nose over and pulled maximum power on the good engine while hitting the jettison switch for our two 650 gallon drop tanks. It was at this point that a 7.62mm round came through my windshield and hit me dead center in the ceramic armored vest I was wearing. The round bounced off the vest and hit me in the left arm, just above the elbow. I did not even realize I had been hit because it felt like I had cracked my elbow on the armored seat. There was no pain and my fingers went numb, just like when you hit your elbow. At this point I was not even thinking about anything other than surviving the upcoming crash of our helicopter. We hit the tree line on the riverbank and watched the rotor blades chop off some of the branches. Our good engine was now 20 degrees over max temperature and our rotor RPM was down to about 94%. We then staggered into the smoke cloud laid down by our fighters and could see nothing. Once again, the Sandy lead came to our rescue, calling on the radio “Jolly turn right, Jolly turn right”. Being in the smoke cloud probably saved us because the small arms fire stopped and we were able to pick up a few more knots or airspeed. When we exited the smoke, we were able to duck down to the river surface and get our airspeed up to about 65kts and get the power reduced on the overheated engine. Sandy lead guided us to the little canyon we had come down and we managed to exit the river valley. We now had 65 miles to fly to get to the nearest friendly base, Nakhom Phanom. We had over 80 holes in the aircraft, smoking hole where our left engine had been and fuel on the floor of the cargo compartment. It was at this point that I discovered that I had been hit when I noticed that there was blood on the sleeve of my flight suit and it was leaking down my arm into my glove. Our Pararescue specialists performed first aid and wrapped up my arm on the one-hour flight to safety. During that night, Wolf 06 Bravo, called on his survival radio and was heard by the FAC overhead and by his pilot, Wolf 06 Alpha. He said the NVA were crossing the river to get him. Gunfire was heard and the radio went silent. 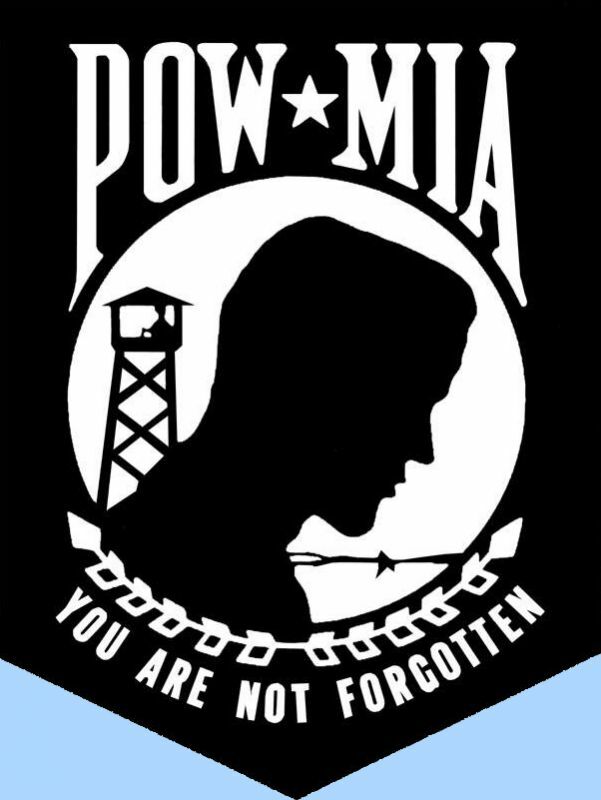 1/LT Dennis G. Pugh was listed as MIA and later declared KIA. The Search and Rescue effort continued the following day with airstrikes against the enemy all day until another Jolly Green made it through the enemy fire, taking numerous hits and rescued Wolf 06 Alpha, Captain Richard A. Rash. Two Sandy A-1’s were shot down during this rescue effort. The first managed to steer his aircraft out of the valley before ejecting and was picked up immediately by a Jolly Green. The other Sandy exploded in mid-air and was presumed KIA. The motto of the Aerospace Rescue and Recovery Service (ARRS) was “That others may live” and this mission certainly proved the motto. The ARRS no longer exists and the rescue mission has been picked up by the Special Operations squadrons. Another FAC aircraft was lost on the 19th when a Phantom (using the radio call sign Wolf 6) was shot down when controlling a strike near Ban Senphan at the southern end of the Mu Gia Pass. The aircraft was hit by 37 mm AAA and burst into flames. Both crew ejected safely and both were in voice contact with other aircraft once on the ground. A rescue attempt was delayed until the morning of the 20th due to enemy activity and approaching darkness. When the rescue task force returned in the morning Dennis Pugh reported that he was surrounded by enemy troops and several attempts to rescue him had to be abandoned after intense ground fire had shot down a Skyraider. In Pugh's final transmission he told the orbiting aircraft to bomb his position as the enemy were closing in. He kept his fingers on the transmit key and the horrified listeners heard North Vietnamese voices and between 15 to 20 gunshots followed by silence. The aircraft then bombed the position. 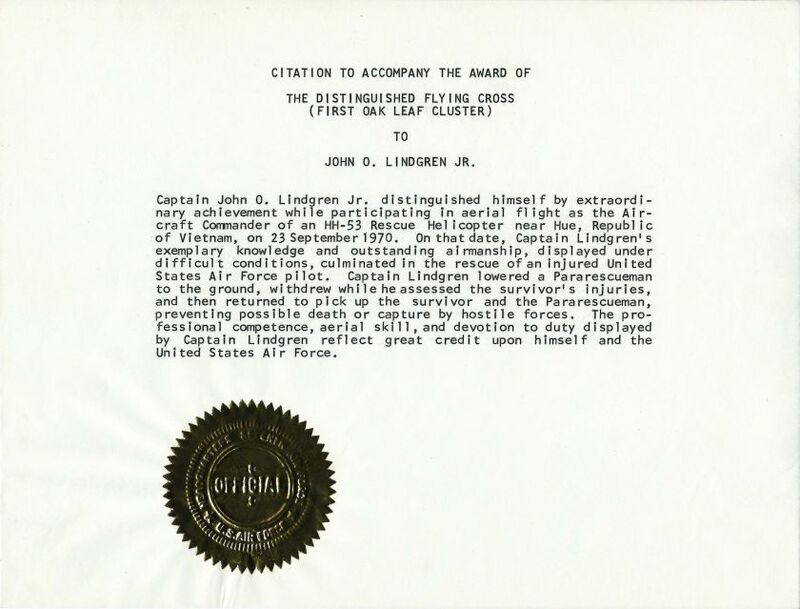 On the 21st another Skyraider was shot down but Capt. Rash was then rescued by a 40th ARRS HH-53C from his hiding place in a cave, despite being badly injured. Dennis Pugh could not be found and was presumed to have been killed during or after capture. 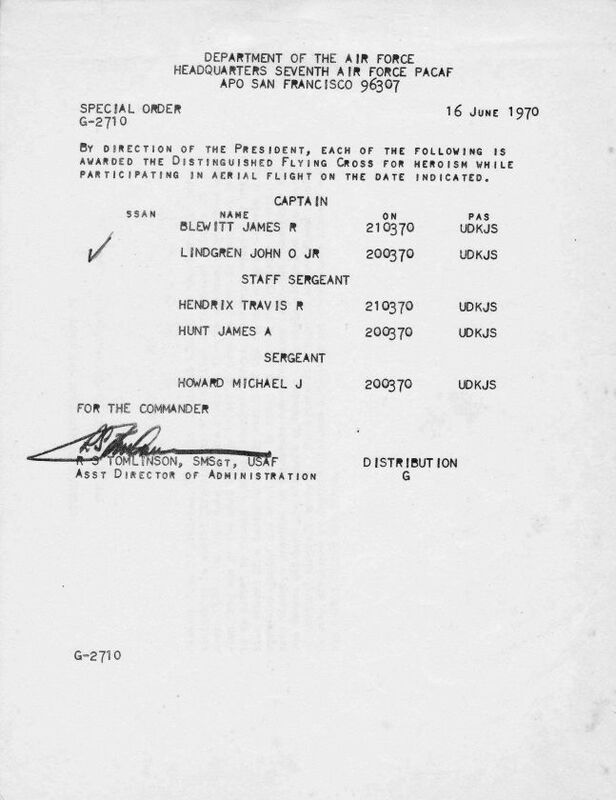 Lt. Pugh's identity documents were later displayed in the Hanoi Central Military Museum." Capt. 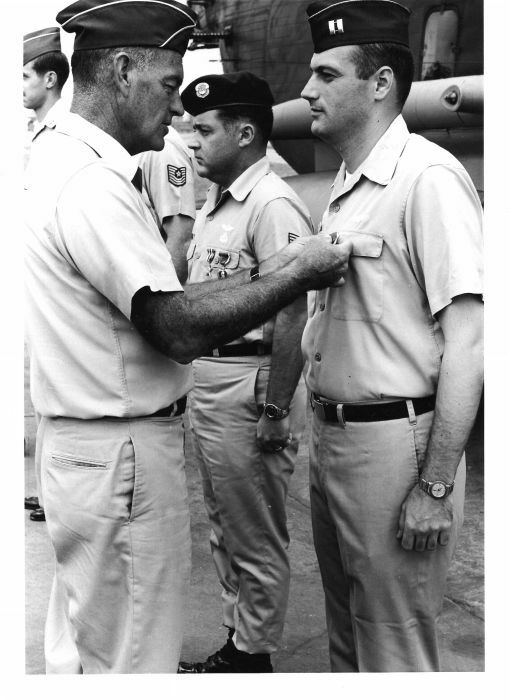 John Lindgren receiving The Purple Heart medal from 7th Air Force Commander General George Brown during awards ceremony at Udorn RTAFB, Thailand. Capt. John Lindgren (far right) at Awards ceremony for 40th ARRS members who participated in the Wolf 06 and Boxer 22 rescue missions. L - R Lt.Col. Frank Catlin, Maj. Bert Berthold, Capt. Rich Baskett, Capt. Ed Sichterman, MSgt. Edward “Red” Willis, TSgt. William Lester and Capt. 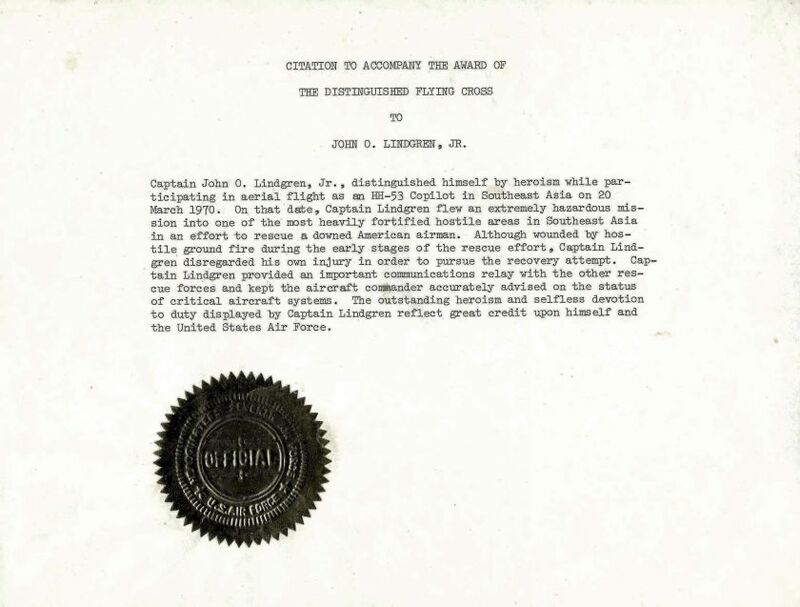 John Lindgren. For the mission decribed in the Citation below. A flight of F-105s was dispatched to bomb a ford in southern Laos 10 miles southeast of the A Shau Valley. Capt. Newhouse's aircraft was hit by 37 mm flak during the attack and he headed northwest into South Vietnam to try to reach Da Nang or the sea. 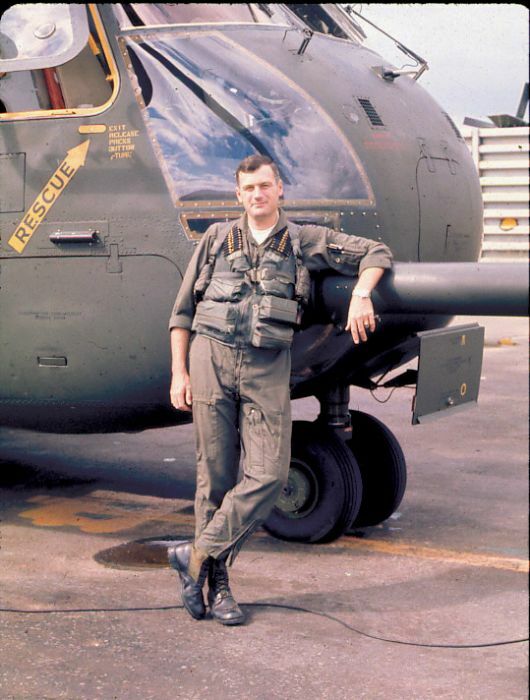 He was forced to eject about 10 miles west of Hue and finished the rest of his journey by USAF helicopter. This aircraft was the last F-105 Thunderchief lost from Takhli RTAB. On 7 October the 355th TFW ceased combat operations and prepared for deactivation on 10 December. Most of the aircraft and pilots were sent to McConnell AFB but a few went to the 12th TFS at Kadena. The only Thunderchiefs left in theater after the 355th left was a handful of Wild Weasels at Korat."